The Australian-American relationship has been the central issue in Australian foreign policy since the Japanese attack on Pearl Harbor in December 1941. War in the Asia-Pacific brought Australia into a crucial and ultimately successful military alliance with its powerful Pacific ally, the United States. The Australia, New Zealand, United States Security Treaty (ANZUS or ANZUS Treaty) is the military alliance which binds Australia and New Zealand, separately Australia and the United States to co-operate on defense matters in the Pacific Ocean area, though today the treaty is understood to relate to attacks worldwide. Australia and the United States alliance is one which has strengthened over time and is considered very important. This 1/2oz silver bullion coin commemorates this bond and is issued as legal tender under the Australian Currency Act 1965. 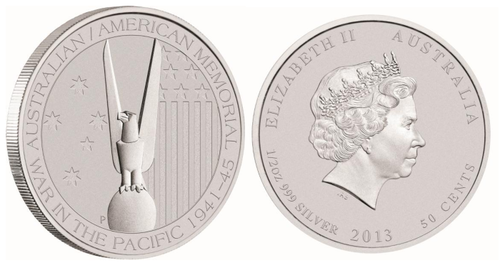 The coin’s reverse features the eagle which is located on the top of the Australian–American Memorial in Canberra, and commemorates the role of the United States in World War II. It also features elements from both county’s flags and the inscription AUSTRALIAN/AMERICAN MEMORIAL, WAR IN THE PACIFIC 1941-1945. The coin’s obverse bears the Ian Rank-Broadley effigy of Her Majesty Queen Elizabeth II, the monetary denomination, 2013 year date and coin’s technical specifications. These bullion coins are presented without capsules in protective acrylic tubes of 25 coins. There are 20 tubes to a monster box.